Thanks to list member Marcia Laycock (and her insomnia) for a creative variation of the classic poem. Way up above 60 where Arctic winds blow. A dreaming of Christmas, like me and like you. For this was the Yukon, what more need be said? There came such a ruckus, it gave me a fright! A loaded up dog sled, mushed on at a clip. The dogs (not reindeer) he drove with such skill. "Mush up Brutus, Muskwa, I said haw, go right! There'll be plenty of travelin' for all of us tonight." Had a touque made of wool on the top of his head. With his beard so crusted and frozen so white. And both so astonished, that neither one spoke. He asked in a whisper "Are you really Santa Claus?" And he smiled as he gave his mysterious wink. "TO ALL CHILDREN OF YUKON - MERRY CHRISTMAS! STAY WARM!" 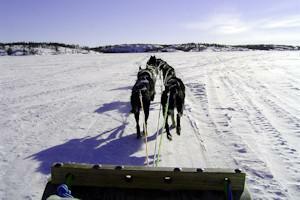 Brutus, Muskwa: common names for sled dogs - Muskwa means little bear. scarf: an essential wrap to go around nose and mouth, preventing cold air from freezing the lungs.